5. possibilities of quadrofonic audio usage. These projects further elaborate on Marnix de Nijs’s earlier oeuvre of 'accelerator works’. 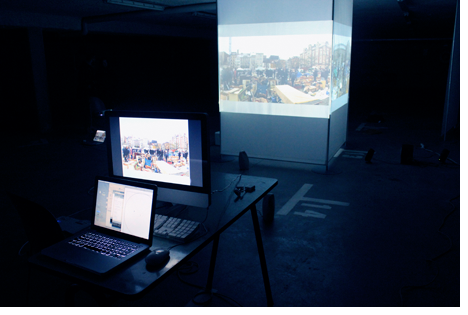 In previous Panoramic Accelerators the focus is primarily on the physical interaction between the user and image. In this new line of projects, the specific cinematic aspects of this relatively new technology are still being examined in practice. The first workshop, under the title Postcinema 360° Chronodeon Saga, was presented during the postgraduate program for the Film and New Media Deparment at NABA in Milan in 2011/2012. Mediaresearch Panoramicinema. 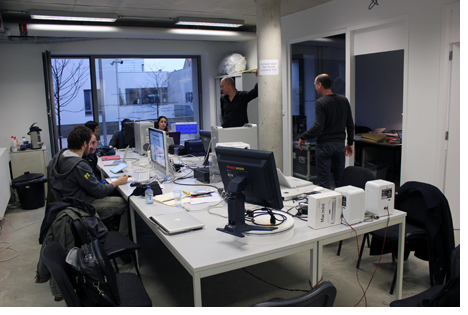 Another workshop, under the title 'Practice in Immersive Storytelling', was included in the postgraduate program of Transmedia in Brussels in 2012. A children’s version, BubbleScape360, was produced for the Cinekid Festival in 2012. Additionally, Marnix de Nijs was commissioned to develop a special adaptation, HOVERING STRP-S, for the STRP Festival, in March 2013.